According to Food Banks Canada, more than 4 million Canadians – both working and unemployed – live with food insecurity and hunger. And children under 18 make up over a third of those who visit food banks. 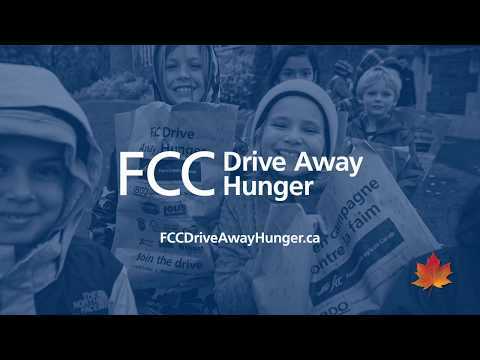 Since 2004, FCC Drive Away Hunger has helped by collecting more than 50 million meals in total, with 100% directly benefiting food banks and school feeding programs in Canada. On a tree-lined rural road not far from the outskirts of Listowel, Ont., FCC district manager Dale Snider sat in the cab of an open tractor, surveying the flatbed of food behind him. Piled high were cans, boxes and bags of non-perishable items: soups and juices, pastas and baby formula, oatmeal and canned meats. It was October 2004, and FCC Drive Away Hunger had just been born. That first year, Dale collected 60,000 pounds of food – that’s the equivalent of 60,000 meals – for local food banks. He’d spent eight days on the road, pitching his tent in a different field or farmyard each night and depending mainly on FCC customers for food and fuel. The result was a testament to compassion and generosity: although BSE was decimating the cattle industry and many rural Canadians struggled to feed their own families, the industry and the community pulled together to give what they could. In some areas, that drive delivered a full year’s worth of food. Fast-forward to 2019. Our industry is thriving, and the drive is still going strong. Dale’s vision and enthusiasm were contagious, and thanks to more than 279 industry and community partners – and 409 schools – FCC Drive Away Hunger collected a record 9.5 million meals for Canadians in need last year. Find media contacts, photos, quotes and statistics in the FCC Drive Away Hunger Newsroom.